There are many naturally occurring processes that influence the climate – causing it to either warm or cool. These natural cycles have, in the past, resulted in regional and global climates that are very different than our climate today. These natural influences are still at work but have recently been overshadowed somewhat by the influences of human-produced greenhouse gases. The Earth’s orbital patterns are always changing. This variation follows cyclical patterns that take thousands of years to repeat. The point the Earth is at in the cycle changes the distribution of solar radiation, and therefore, cooling or warming in different parts of the world. The amount and distribution of solar energy that Earth has received (due the Earth’s natural orbital variations) is thought to be responsible for triggering major climate epochs in the past, such as ice ages. The eccentricity is the change in the Earth’s orbit around the Sun. The path that the Earth takes around the Sun varies in its “circularity”. The Earth’s path around the Sun is at times almost circular. It then slowly shifts to become more elliptical. And then back to circular. The period of this cycle is about 100,000 years. The eccentricity is the ratio between the Earth’s greatest distance from the Sun and the Earth’s shortest distance from the Sun. 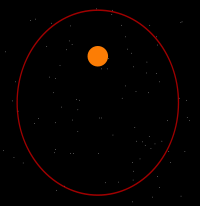 A greater eccentricity is indicative of a more elliptical path around the Sun. 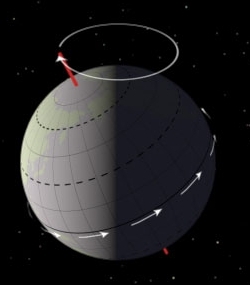 The obliquity is the shift in the tilt of the Earth’s axis. 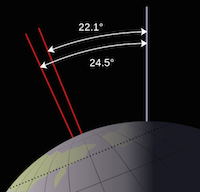 The tilt varies by just over 2°, with values ranging between approximately 22° and 24°. This change affects the amount of solar radiation received by the higher latitudes. the period of this cycle is about 40,000 years. More tilt results in more solar radiation being received at higher latitudes during the summer, while less tilt results in less solar radiation being received at higher latitudes during the summer. “Precession of the Equinoxes” refers to changes in the Earth’s “wobble”, or changes in the position of the earth in its orbit around the sun at the moment of the equinoxes and solstices. The period of this cycle is about 15,000 years. This changes the part of the planet tipped towards the Sun at different points of the earth’s eccentric orbit. This effects the amount of solar radiation received at that part of the planet. This in turn affects the climate in the region. 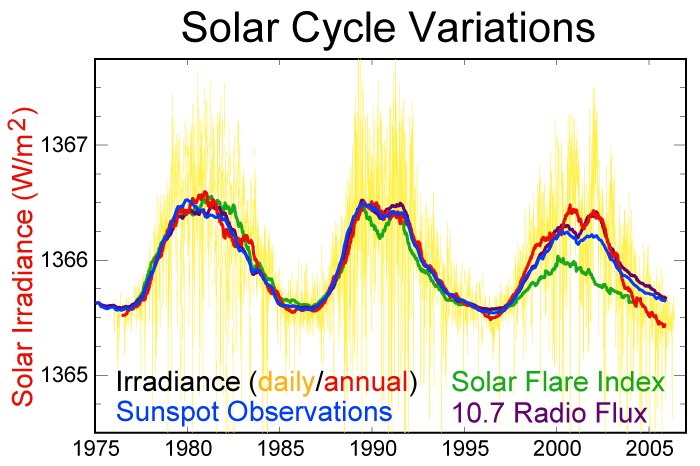 Based on the data that has been obtained thus far, we have observed that there is a cycle of increases and decreases in solar output that occurs, but its effect on warming is much less than the effect that can be attributed to greenhouse gases.